OK. Perhaps this isn’t a completed project in the usual sense, but it’s about as far as I’m going to take it for a while. It’s a skill-building practice project. 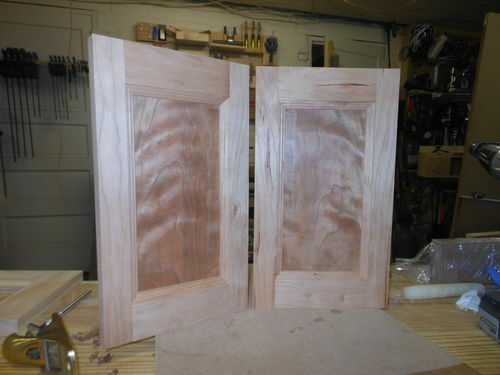 I have in mind twin small spice boxes with something like this for the doors. If I build those, I expect I’ll use narrower rails and stiles. The prettiest part here is the panel, and I don’t want it overpowered by the surrounding wood. In the meantime, I’ll just put this on the shelf and admire it. I’ve got two of these panels. 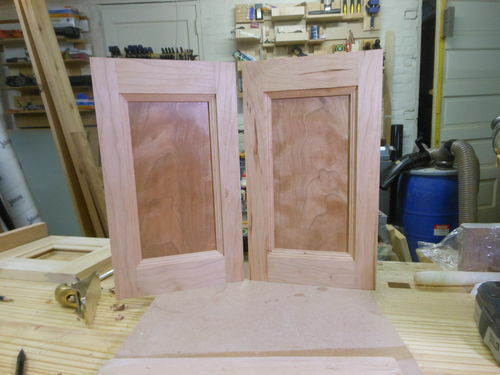 I had a piece of cherry, and I managed to resaw it on my table saw. More dangerous than I like to think, but that was my only option (except a handsaw) since my band saw has a 4” max height, and going through cherry is pretty tough. The two book-matched panels next to each other are really something to see. They’re about 4” x 9” x 1/4”. There’s no finish on them but I planed them, and then sanded them all the way up to sandpaper that feels about as rough as notebook paper. They really shine. I used a matched pair of router bits from Rockler. 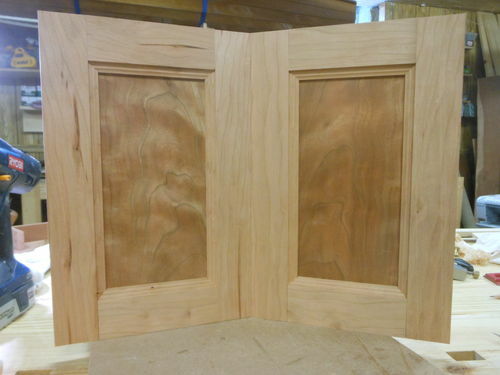 Here is a picture of the two book-matched panels. They really look better than they do in these pictures. I think so, anyway. I ripped a 1/2” off the stiles. Less frame, more attention to the panel.